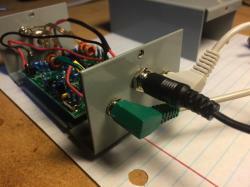 I hope the wider ham community enjoys listening to my little WebSDR receiver or that it inspires others to build their own. I have also built a Raspberry Pi APRS iGate for the ISS and I’m working on a 20m WebSDR receiver as well as an amateur radio satellite tracker. Click here for a list of my other amateur radio related Raspberry Pi projects. Wolfson Audio Card – note this works on the 30-pin Model B only! Perhaps the most asked question other than what sound card I’m using (see above) is how to get the drivers for the Wolfson to work. After several nights of trying to cross compile the drivers for my Pi’s kernel, I decided to use the “official” Wolfson OS image. Wolfson 3.10 Master SD Card image (link) – This OS includes the drivers for the Wolfson Card. WebSDR software by Pieter, PA3FWM. He is a busy man. Have everything in place before contacting him for the software and be patient. There’s one of him and thousands of us.